In June 2013, I participated in a panel discussion on “Innovation management – possibilities and limits ” in the framework of the two-day Strategy Circle Maschinen- und Anlagenbau (Strategy Circle for Mechanical and Plant Engineering). This three-part series aims to shed more light on the issues discussed in that setting. Part 1 will focus on generic issues in the field of innovation, while part 2 and 3 will deal with administrative aspects of innovation management within the company and with problems that may arise from cooperation with third parties. People regularly wonder why innovation is happening at all. If we take a close look at human history, we find that, to some degree, innovation is a natural phenomenon. Innovation has always been crucial for our survival – it has helped to strengthen both the individual and humanity as a whole. Ultimately, numerous evolutionary developments stem from the will to survive. Today’s technological developments are often more evolutionary than revolutionary, too. And, in another parallel to natural history, new innovations may endanger the continued existence of current technology. Take the computer mouse. Back in 1983, Apple was the first company to introduce a mouse. Some years later, mice were a staple feature on all desks. Then, a few years ago, touchscreens were developed, and people only needed their hands and fingers to use their PCs and tablets. Touchscreens and voice command devices may replace mice. For the first time in history, the market for mice is shrinking. The development of computers themselves is another good example. For years, PCs were the standard device. Then, laptops and notebooks (their lighter cousins) gained ground, at the expense of PCs. Now that iPads and similar devices are available, sales figures for notebooks are declining palpably. And once iPads are equipped with office applications, this development will pick up speed. These examples answer the question of whether innovations need a market. They certainly do. Without a market, which offers an opportunity to sell new products, there is no innovation, but only invention. Video tapes and video discs are good examples of this claim. Video tapes – which were later replaced by DVDs – were not just an invention, but also an innovation, as they were successfully sold on the market for years. In contrast to that, the TED (Television Electronic Disc), which was developed in the 1970s to store audio and video data, soon vanished from the market. The invention in itself was interesting, but it did not become an innovation – it lacked market success. Still, the technology was a forerunner of current video disc formats such as DVDs or Blu-rays. It is usually quite uncertain whether an invention can succeed on the market and become an innovation. The history of technology is full of interesting inventions and economic failures. That is why managers are so interested in finding out what markets and customers desire and where innovative action might make sense. Obviously, it is difficult to give a general answer to these questions. There is no such thing as the market or the customer. The relationship between a company and its customers is key. Customers should keep one important aspect in mind: They should only describe the problem for which they desire an innovative solution, but they should not give excessively detailed specifications. Specifications will – quite unconsciously – drive the inventors’ imagination into a certain direction right from the beginning and thus limit the potential for truly new and innovative solutions. At some point in time, managers will begin wonder whether an innovation is ripe for serial production, i.e. whether it can survive on the market from a technological vantage point. Different corporate divisions will certainly give different answers to this question. Developers will always want to fine-tune their new products further to be “150% certain” that they work as planned. It is therefore certainly helpful to have sensible innovation procedures in place. They will enable managers to market products which are safe to use, but meet only 95% of developers’ expectations – before the R&D department spends another three years on getting the remaining 5% “just right”. Of course, this is a tricky decision. However, if managers wait too long, the optimal time for launching the product may pass. It is impossible to say exactly when an innovation is ripe for the market. Companies – and their top managements – have to take certain risks to exploit opportunities in terms of “time-to-market”. Managers would often like to have a crystal ball to gauge how information, technological developments, market trends and political framework conditions will develop. That would help them to plan for the next five years, particularly in a very uncertain environment. They would be able to deal efficiently with external complexities stemming from market and technology trends. Still, mega trends – both in the area of technology and in other areas – are general knowledge. Globalisation, urbanisation, environmental protection, energy, demographics are only a few examples of mega trends, which corporate managers can include in their plans. What is much more important is that managers sniff out those numerous minor, undiscovered ideas which might put their company at an advantage. 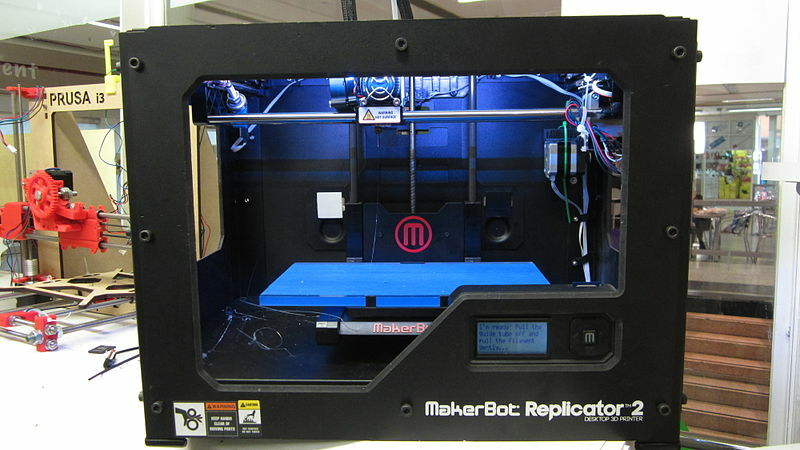 The hype about 3D printers was largely caused by the media, which have reported extensively on the issue. But how many ideas are out there which are overlooked simply because they are not covered by the media? There is only one solution: keep your eyes peeled. And finally, it is very difficult for companies to anticipate political framework conditions. Political conditions change constantly and erratically. The turnaround of the German energy policy (exit from nuclear power) is a good example. Dieser Eintrag wurde veröffentlicht in Business Innovation und verschlagwortet mit 3D Printer, Computer Mouse, Innovation Management, MakerBot, Replicator 2, Videodisk von Guido Beyss. Permanentlink.